Innovation is described by some as ‘connecting the dots’. The iconoclastic chief of the Virgin Group, Sir Richard Branson, uses the mantra “A-B-C-D. (Always Be Connecting the Dots).” The magic in this recipe is seeing the dots in the first place, since most people view a subset of what’s really out there and work within that framework. It is a criticism of much of higher education that students are taught to ‘collect the dots’, rather than connecting them (Seth Grodin, Stop Stealing Dreams) . These are critical observations in the HBR article by Regina E. Dugan and Kaigham J. Gabriel, former leaders at DARPA. They have taken these lessons learned and translated them to the Motorola Mobility group’s Advanced Technology and Projects (ATAP), which Google picked up in 2012. They address what they believe are the ingredients of the ‘secret sauce’ DARPA has discovered and why most industries and businesses have failed to replicate it. We believe that the past efforts failed because the critical and mutually reinforcing elements of the DARPA model were not understood, and as a result, only some of them were adopted. Our purpose is to demonstrate that DARPA’s approach to breakthrough innovation is a viable and compelling alternative to the traditional models common in large, captive research organizations. It might be logical to translate this to the university context and to the organizations or units within it that try to address emerging technologies and their application to issues of teaching, learning and entrepreneurship. There is some utility in this, but it’s unfortunately not a simple parallel with mappings of DARPA processes to university practices. Were it ever that easy. 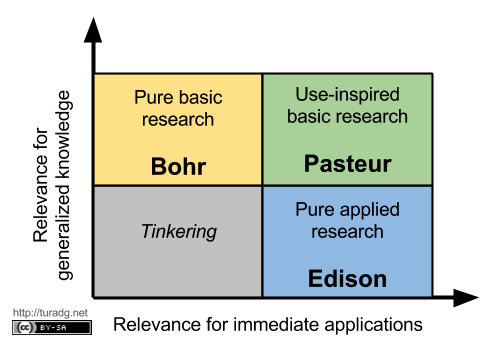 The upper right quadrant is the sweet spot in this model, labelled after Luis Pasteur for his work advancing microbiology while coming up with practical advancements such as discovering the principles of inoculation, pasteurization of milk (from whence the term comes), and microbial fermentation. DARPA ‘lives’ in Pasteur’s Quadrant. taxpayers shouldn’t be “subsidizing intellectual curiosity” at universities. If a university is not a place where intellectual curiosity is to be encouraged, and subsidized, then it is nothing. The challenge is that most higher ed institutions are confronting rapid changes in areas such as big data, analytics, and computational algorithms, but these rarely find their way back into the course teaching and learning practices of the academy. Informing the T&L space based on advances in data & learning analytics, visualization, and cognitive sciences is tricky. On the one hand most organizations who own this responsibility are in Edison’s quadrant. They are focused on applications of practical value, often articulated by the caution not to ‘experiment on’ the young charges that are in faculty classrooms. Their goal is to move best practices of established value more widely into the realm of the iconic space where learning purportedly takes place – the classroom. Nevermind that there is substantial data to suggest that the classroom is among the last places that substantive learning happens. This is closer to the situation of higher education because most technology enabled learning support organizations are not doing novel, discovery oriented research. That’s the province of the faculty or departmental research labs and institutes. Partnerships with these discovery-focused research facilities can be exhilarating and valuable. But they are not the primary work or intellectual space for the application of learning sciences and new practices to the learning mission of the academy. The trap of applied research learning science groups is the trap of incremental innovation. These are well within the existing frame of reference, representing slight improvements that return immediate pay offs, even if relatively small. The key idea is that the framing of the problem has not been altered, only the exact steps toward getting to a better solution. In the case of Philips the researchers took a step backward or sideways. The improvements in computed tomography (CT) scanning were steadily advancing. In fact the number of images that a CT scanner could capture with each rotation of the X-ray tube had increased sixteenfold from its introduction in the early 1970’s through early 1980’s and the rotation speed had doubled (improving the machine’s ability to compensate for patients’ movements). It would continue to improve, but so would those of their primary competitors. What else could improve scan results or speed the process overall? For many getting a CT is a profoundly anxiety provoking experience. You aren’t getting one because things are going well. Further the process is foreign from any normal person’s experience, full of strange machines, injections, and loud noises. The result of all this? Patients don’t lie still when on the scanning bed. No matter how accurate the scanning technology gets, fidgety patients lead to lousy images more time to capture decent ones, and an overall unpleasant experience. For some, especially children, the patient has to be sedated – more time, additional expense, and further negative response to the whole diagnostic experience. Expand the frame. What is the totality of the experience and how can addressing these other elements enhance the core effectiveness of the incrementally improving technology? The answer was to make the experience leading up to and within the CT scanner more engaging and distract the foreign and fear inducing strangeness it tended to produce. By using LED displays, video animation, RFID (radio-frequency identification) sensors, and sound-control systems, the patients experience was now the focus. The result was patients stayed more quiet, fidgeted less and the picture quality improved dramatically. Fewer patients required sedation, making the process overall shorter on average. Change the frame, solve a different but related problem, and make improve a process that includes the one that was the initial focus of attention. But to do this required boundary crossers. These people have much of the core knowledge base of the primary researchers but who are approaching the problem from a different perspective. In the case of Philips and the CT example, they certainly had their share of doctors, hospital managers, engineers of medical equipment, and marketing experts. What they brought to the table to augment this were architects, psychologists, contemporary interior designers, LED technologists and media specialists, interaction designers, and game oriented interactive hardware and software designers. 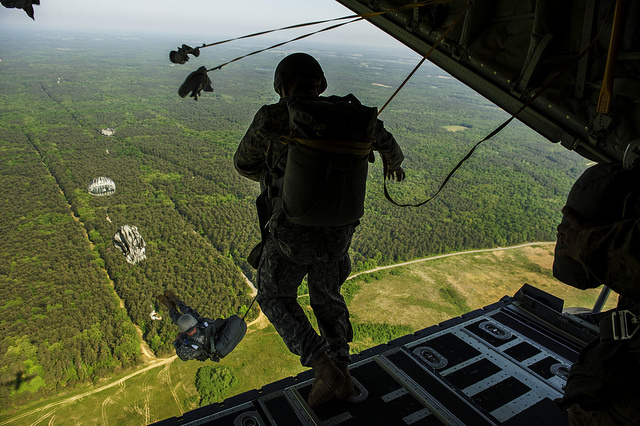 There are critical elements in the “special forces” approach that are critical to groups trying to apply what we know and what we’re learning about cognitive sciences and learning to enhance the undergraduate experience. Indeed, a portfolio of work that includes ambitious goals, temporary project teams or “hot teams”, and independence are necessary ingredients. But so to is the focus on applied innovation, problem solving in the practical world of undergraduate education, and sitting on the boundary of Pasteur’s and Edison’s Quadrants where the work is creative, socially meaningful and pragmatic.